"The Day The World Went Away" is the second track on the Left disc of The Fragile. It was released as a single preceding the release of The Fragile and received the designation of Halo 13. The song's lyrics are rumored to be about the death of Trent Reznor's maternal grandmother, Clara, which occurred before The Fragile was recorded. Analysis of the lyrics do support the theory of this song being about a reaction to death, but Reznor has not explicitly revealed his lyrical inspiration. The "Buddha Debutante Choir", credited for background chants on this track, was actually a random group of bar patrons who were brought in from Igor's Buddha Belly across the street from Nothing Studios. The song was used in the trailer for Terminator: Salvation, released in 2009. It can be viewed here. This is the original album version, found on The Fragile. It follows the percussive and aggressive "Somewhat Damaged," and is one of Nine Inch Nails' most uniquely structured songs. Musically the opposite of "Somewhat Damaged" in almost every way, it lacks the use of any standard form of percussion, and begins with drones that fade in during the ending of "Somewhat Damaged." These soon give way to loud, distorted guitars and bass playing a simple five-chord progression. As it repeats, a synthesizer melody enters on top, ascending in intensity and pitch until it drops out along with the guitars. The bass continues playing the progression above the drones while Reznor sings the song's verse, backed with a distant harmony for the second half. The song features the use of a mandolin in this section, another first for NIN, and it is the mandolin alone that strums a bridge from the end of the verse and into the final section, characterized by a return of the loud guitar and bass playing a new progression, joined by group vocals singing a wordless melody. This all gives way at the end of the phrase to a quiet percussive sound that ends the song, repeating while fading out into the opening soundscape layers of "The Frail." The song's introductory guitar chords are extended by roughly 30 seconds on The Fragile vinyl version. Released exclusively through Apple Music as part of The Fragile Instrumental. Instead of the album arrangement, this is an instrumental of the "Quiet" version, though it retains the wordless opening vocal layers. Released exclusively on The Fragile: Deviations 1. This is an instrumental of the vinyl version. The longer runtime is due to an extra 34 seconds of the introductory drone. At the end of the song, there is only one guitar pluck, instead of three. In this version, the introductory drone does not fade in, the verse vocals are a different take, and the final section is only half as long. It also does not repeat the quiet percussive sound that ends the song as on the album version. This is a very different version of the song. The structure was changed significantly, moving a different version of the chanting to the beginning of the song and featuring additional vocals by Kim Prevost. The first half features mainly atmospherics and piano behind the vocals, while the second half features the final bass riff, quiet guitar, and keyboard pads. This remix was done by Reznor and seems to have formed the basis of the Still version as well as the extended version played live as exemplified on And All That Could Have Been. This dub remix by Porter Ricks revolves around a thumping beat. The distant vocals can be heard beneath it. The DVD version of And All That Could Have Been featured this song as an Easter Egg. Unused clips from the scrapped video are merged with live performance footage. The CD version features the same performance of this song in the regular playlist. A stripped down, acoustic version of this song was included on the Still album. It mostly resembles the Quiet mix of the original song, but adapts the end of the song as played on tour into a more relaxed, atmospheric version. 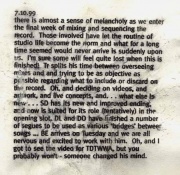 Journal entry from The Fragile sessions in 1999 published on nin.com mentioning the unused music video for "The Day The World Went Away". This song is among the many Nine Inch Nails songs that have had a music video scrapped. The video, which was partially finished, apparently showed images of a funeral. Parts of the video appeared as an Easter Egg on the DVD version of And All That Could Have Been. The footage contains black-and-white shots of Reznor in a forest, and color images of a black kingsnake slithering in sand. It also includes Reznor standing in a room with his back to the camera and shows flowers, as well as a feather floating in the air. Right before it cuts to the black-and-white footage of Reznor, for a split second, it shows a man (most likely Reznor) hovering in the air in a red room. Right in front of him is a bright light that instantly brightens, making the screen white for the black-and-white footage to come in. The second half of the video contains live performance footage of the band. "The video was black and white. I have seen rushes of it. It featured a funeral, Trent at the funeral (in the style of 'November Rain'). I also saw footage of a black haired beautiful girl. She really did stand out, the other people had 'common' 'nonspecific' faces. It was Trent attending a funeral and seeing this girl. Then he follows her. That's about all I can remember. Trent thought it was too personal, because of the connection of the song with his grandmother. So that's why we never got to see it." "The Day The World Went Away" has been performed live since the Fragility tour started in 1999. When performed live, the second half of the song is extended after the verse and the guitar progression. This extension seems to be modeled after the Quiet mix, but features a tom-driven drum rhythm as well as the guitar doubling the bassline in a higher register. This new section builds in intensity as melodic synthesizers and distorted guitars welcome in the wordless group vocals, eventually becoming more bombastic and louder until ending with two power chords. An example of this altered structure can be found on And All That Could Have Been. On the European leg of the NIN 2013-2014 tour, the album arrangement was played for the first time. During the Tension 2013 Tour, this song featured backing vocals by Lisa Fischer and Sharlotte Gibson. Previous track - "Somewhat Damaged" Track 2 from The Fragile Left (CD), Side A (Vinyl) Next track - "The Frail"
This page was last modified on 9 February 2019, at 22:27. This page has been accessed 151,797 times.